Eric Gjerde demonstrates 25 of his favorite tessellations and turns them into projects for newcomers as well as experienced origamists. With step-by-step instructions, illustrated crease patterns, and how-to photos, you'll learn to create these wonderful designs yourself. Eric's first book covers the fundamentals of origami tessellations, provides history, and describes simple beginning techniques with detailed illustrations and photographs. An extensive gallery showcases tessellations folded by the world's leading origami fine artists---inspiring you to experiment, innovate, and eventually create your own unique designs. When asked by his parents what he wanted to be when he grew up, five-year-old Eric Gjerde replied, "a paperologist." Throughout his childhood and adolescence he enjoyed paper crafts and origami. After preparing for a technology career, Eric kept looking for an artistic outlet to balance his creative side with his professional life. He returned to his childhood love of paper and discovered a deeper appreciation for the beauty of origami by exploring and researching new areas of folding--including the geometric art of origami tessellations. He currently balances dual careers as a technology professional and as an artist in Minneapolis. … It is surprising and challenging to see which variety of ornaments can be generated this way out of one single sheet of paper. The procedures are explained step by step and allow to reproduce these interesting planar ornaments. … The surprising and wonderful results are worth the effort. 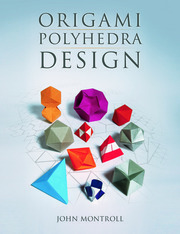 I really enjoyed this exercise … [the book] can be recommended to whoever is interested in the field of planar ornaments and its connection to origami. 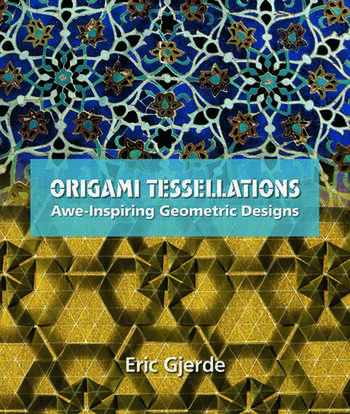 In this gorgeous book, Eric Gjerde has presented clear, easy-to-follow instructions that introduce the reader to the incredible beauty and diversity of origami tessellations. Here [Gjerde] demonstrates 25 of his favorite designs that use tessellations, geometric patterns that can repeat forever, to make paper surfaces of intricate pleats and folds. For most learners, he says, there is a moment of epiphany after which it all makes sense and they can never go back. Beginning and experienced origamists are welcome. If Eric Gjerde’s new book Origami Tessellations: Awe-Inspiring Geometric Designs needed an alternative title, it might be: Origami: It’s not just for kids any more! 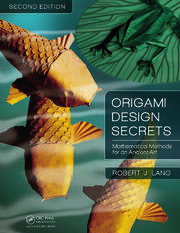 Of course origami has never been just for kids, but this book should convince you that you can create some great art using origami techniques. . . . The projects are graded as beginner, intermediate and advanced, but 'beginner' should be interpreted as someone who has previous experience with origami or a strong interest in learning about it, because even the simplest projects include a lot of steps and demand precise folding. But for someone who enjoys doing origami and wants to try some complex projects, the directions are very clear and the photographs of the finished work should serve as an inspiration. Gjerde’s [book] is as much an art book and is a feast for the eyes on every page . . . It is not standard origami, nor indeed standard tessellation. It takes tessellations into three dimensions and then back into two . . . All pieces are from a single piece of paper, prefolded into the grids. You would not think so when, for example, you have a result that looks like woven strips of tape or a triangular weaving reminiscent of M.C. Escher. Origami tesselations in this book means paper folding by repeating special patterns. Explicit instructions are given how to obtain a large variety of origami tesselations of great beauty and difficulty. The results are interesting geometric figures which - however - are presented from an intuitive point of view. ... Several of these origami tesselations are comparable with patterns on a tile floor or the Islamic artwork at the Alhambra in Spain. The reader is invited and inspired for [his or her] own experiments and ideas, especially for creating [his or her] own patterns in the sense of origami tesselations. This richly illustrated and easy-to-read handbook is an excellent resource for origami hobbyists. Images from the text could also be used to support classroom discussions of symmetry, tessellation, and multicultural mathematics. ... 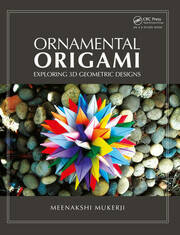 This book is a valuable resource for origami enthusiasts and anyone with an interest in tessellation-based art.